Subzis are an essential part of any meal. Although there are accompaniments like pickles or chutneys that can do the job on a hurried day, a meal does nevertheless seem incomplete without a subzi to add health and taste to it! If you understand the logic behind making quick subzis, you never have to go without it again. The idea is to use veggies and ingredients like spinach, corn, paneer, potatoes and raw bananas, which cook quickly. If you need to cook in a hurry, you must stock up regularly on paneer, tomatoes, potatoes, onions, corn and green peas. Many of these easily cook in the kadai itself without requiring to be cooked separately. You can then quickly sauté these with a few common spices, and you’re done! Even in the absence of elaborate and rich gravies, some subzis are very tasty and aromatic, because of the magic worked by the tempering. You can prepare some basic ingredients like tomato puree, boiled potatoes or even some basic gravies, and refrigerate them in handy-sized packs, so you can take out what you want, thaw it and quickly conjure up a tasty subzi. The microwave is also a handy tool that helps put together delectable subzis within minutes, as can be seen in the case of recipes like the Darbari Aloo Mutter Sabzi, which is quite a rich dish but prepared quickly and easily using the microwave oven! The Quick Paneer Subzi and Paneer Bhurji are two tongue-tickling treats prepared with paneer, while corn transforms into a Corn ki Subzi or Palak Corn Subzi. The Mooli Subzi and Cabbage and Capsicum Subzi are two quick vegetable dishes that can be part of any meal, any day. When you are in the mood for something more exotic, toss up something interesting but quick like the Kele ki Sabzi, Tomato and Coconut Subzi or the Tava Paneer, Mushroom and Green Pea Subzi. All of these are absolutely no-fuss, quick veg subzi recipes that must be part of your essential, everyday cookbook! You will find many more such awesome and convenient recipes on our website and mobile app. Whip up something quick and serve it with rotis, parathas or puris, for lunch or dinner – and get so many compliments that you can’t believe for yourself that it took only a few minutes to make it! 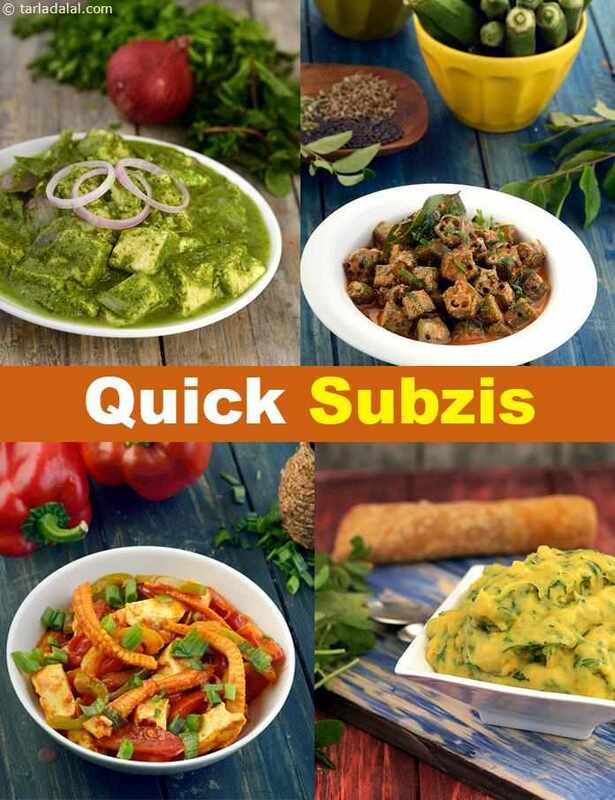 Enjoy our Quick Subzi Recipes, Quick Indian Subzi Recipes and other quick recipe articles below. Mushrooms and a slew of colourful vegetables combine to make an appetizing subzi that goes well with plain rotis or steaming hot rice. As always, onions work wonders at increasing hdl levels. Subzi ka korma is a mildly-flavoured dry preparation of mixed vegetables. While you can go with any vegetables for this, i have chosen common vegetables so that the korma can comfortably accompany even rich rotis or puris. This is a great combination of textures and fragrant, spicy flavours that has the added advantage of being quick to make. Enriched with vitamin A, iron and fibre, it is nutritious too.